One of the artists who had an early influence on Weissbort was Cézanne, and this painting refers specifically to the latter’s Still life with plaster cupid in the Courtauld Gallery. 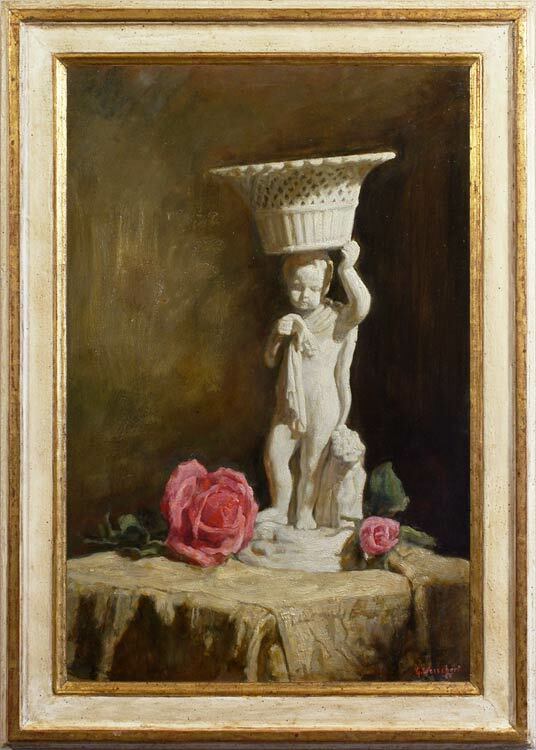 Both use a statuette of a small boy on a table-top, accessorized with drapery and natural objects; Weissbort has, however, remade Cézanne’s work in the spirit of the 18th century Rococo, arranging the table symmetrically, viewing the statue frontally, and creating a stable and balanced composition in place of the shifting vertiginous planes of the Cézanne. It is almost as if Cézanne’s painting has been visualized through the eyes of Chardin, presenting a calm and rational version of what had been questing, experimental and urgent. Weissbort has also once more ‘feminized’ his subject, with brocade, pink roses, and soft warm tones replacing the severe blue cloth, geometric fruit forms and vibrating colours of Cézanne’s work.